I was as baffled to know the name of this place as you are after reading the title. For those who aren’t familiar with the word ‘Khusra’, it means a transexual. We’ll talk about the food in a bit. Let me first share my discomfort for not being able to understand the reason for having such a crude name. I’ll have to resort to guesses since nobody could tell me the real reason. Here is one: There was a chap in the waiters forum in his mid-forties (i think), he was wearing a dopatta and walking ‘that’ walk. He graced us by waiting on our table too. Perhaps it is not them (the management of this dhaba), it is the public that has named the place like this. 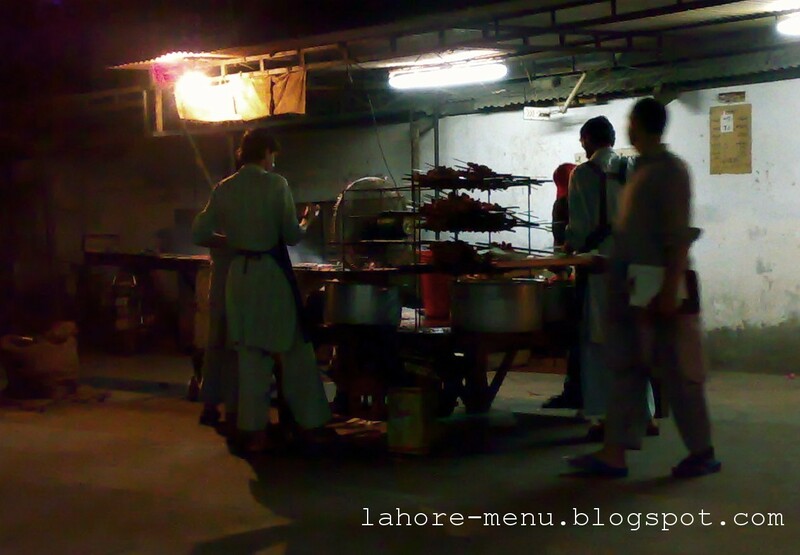 Khusray ke kabab dhaba is located at the obscurest possible place in Lahore. At the junction of Mall road and Tufail road in the cantt area, hidden behind a sort-of-skyscraper hotel building. The dhaba is actually a movable cart parked in an open-air parking lot and customer tables on the other side. There is no sign of any sort on the road indicating its presence which means they don’t have walk-in customers. It is a living example of the word of mouth marketing. 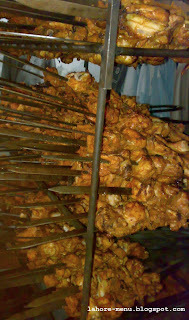 They make really good chicken tikka and chicken boti – boneless chicken meat cubes on skewers and barbequed (see the picture). Although the real popular item is beef kababs but I think I’ve had better kababs than theirs. TryBhayya’s kababs if you haven’t done that already. The next best item is called chicken piece which is around a quarter of a chicken also barbequed on a flat skewer. Raita and Salad are the typical accompaniments. I wouldn’t recommend their Raita though. Pre-independence Sultan Muhammad Shah, the Aga Khan III (1877–1957), led a delegation in October 1906 to Viceroy Lord Minto (1845–1914) for a separate electorate for Muslims. During the talks, the viceroy told the delegation that Indian Muslims rights could be achieved only if they established a political party of their own as Hindus have the Indian National Congress. It was in this background that the All-India Muslim League was founded at Dacca (now Dhaka, Bangladesh), Bengal Presidency, in December 1906, as a political party in British India. It was after the AIML was founded that Muslims of India got the political right of the separate electorate. The Minto-Morley reformatory constitutional law of 1909 incorporated for the first time the provision of allocating one-thirds of parliamentary seats for Muslims. This provision was sustained in all the subsequent constitutional reforms introduced by the British rulers, including the Montagu-Chelmsford law of 1919 and the Indian Act, 1935. After the independence, the League continued as a minor party in India, more of its roots were in the southern state of Kerala, where it has often been in government within a coalition with others. In Pakistan, the League formed the country’s first government, but disintegrated during the 1950s following an army coup. One or more factions of the Muslim League have been in power in most of the civilian governments of Pakistan since 1947. In Bangladesh, the party was revived in 1976 and won 14 seats in 1979 parliamentary election. Since then its importance has reduced, rendering it insignificant in the political arena. Muslim rule was established across India between the 8th and the 14th centuries. The Muslim Turkic Mughal Empire ruled most of India from the early 16th century, but suffered a major decline in the 18th century. The decline of the Mughal empire and its successor states like Avadh led to a feeling of discontentment among Muslim elites. Muslims represented about 25-30 per cent of the population of British India, and constituted the majority of the population in Balochistan, East Bengal, Kashmir valley, North-West Frontier Province, West Punjab, and the Sindh region of the Karachi Presidency. By then Sindh was part of Bombay province and was yet to become a province. In the late 19th century an Indian nationalist movement developed with the Indian National Congress being founded in 1885 as a forum that became a political party subsequently. The Congress made no conscious efforts to enlist the Muslim community in its struggle for Indian independence. Although some Muslims were active in the Congress, majority of Muslim leaders did not trust the Hindu predominance and most of the Muslims remained reluctant to join the Congress Party. The Muslim League was founded by the admirers, companions, and followers of Aligarh Movement. The founding meeting of the League was held on 30 December 1906 at the occasion of the annual All India Muhammadan Educational Conference, at the Ahsan Mqanzil Palace, Shahbagh, Dhaka that was hosted by Nawab Sir Khawaja Salimullah Khan, the Nawab of Dacca. The meeting was attended by three thousand delegates and presided over by Nawab Waqarul Mulk Kamboh, Nawab Mohsinul Mulk and Ameer Ali were also the founding fathers, who attended this meeting. A new Muslim orgnisation was needed because Muslim leaders at that time thought the Indian National Congress was essentially a Hindu organization. Formed in the year 1885, the INC did not have any agenda of separate religious identity. Some of its annual sessions were presided over by eminent Muslims like Badruddin Tyabji (1844–1906) and Rahimtulla M. Sayani (1847–1902). Certain trends emerged in the late 19th century that convinced a sizable group of Muslims to chart out a separate course. The rise of communalism in the Muslim community began with a revivalist tendency, with Muslims looking to the history of Arabs as well as the Delhi sultanate and the Moghul rule of India with pride and glory. Although the conditions of the Muslims were not the same all over the British Empire, there was a general backwardness in commerce and education. The British policy of “divide and rule” encouraged certain sections of the Muslim population to remain away from mainstream politics. The INC, although secular in outlook, was not able to contain the spread of communalism among Hindus and Muslims alike. The rise of Hindu militancy, the cow protection movement, the use of religious symbols, and so on alienated the Muslims. Syed Ahmed Khan’s (1817–98) ideology and political activities provided a backdrop for a separatist identity to the Muslims. He exhorted that the interests of Hindus and Muslims were divergent. Khan advocated loyalty to the British Empire. Viceroy Lord Curzon (1899–1905) partitioned the province of Bengal in October 1906, creating a Muslim majority province in the eastern wing. The INC’s opposition and the consequent swadeshi (indigenous) movement convinced some Muslim elites that the congress was against the interests of the Muslim community. A pro-partition campaign was begun by the Nawab of Dacca, Khawaja Salimullah Khan (1871–1915), who was promised a huge amount of interest-free loans by Curzon. He would be influential in the new state. The Nawab began to form associations, safeguarding the interests of the Bengali Muslims. He was also thinking in terms of an all-India body. In his Shahbag residence he hosted 2,000 Muslims between December 27 and 30, 1906. AIML FORMED: It was on Dec30, 1906 that the AIML was formed. The chairperson of the Dhaka conclave, Nawab Viqar-ul-Mulk (1841–1917), declared that the league would remain loyal to the British and would work for the interests of the Muslims. The constitution of the league, the Green Book, was drafted by Maulana Muhammad Ali Jouhar (1878–1931). The headquarters of the league was set up in Aligarh (Lucknow from 1910), and Aga Khan was elected the first president. Thus, a separate all-India platform was created to voice the grievances of the Muslims and contain the growing influence of the Congress.. The AIML had a membership of 400, and a branch was set up in London two years later by Syed Ameer Ali (1849–1928). The league was dominated by landed aristocracy and civil servants of the United Provinces. In its initial years it passed pious resolutions. The leadership had remained loyal to the British Empire, and the Government of India Act of 1909 granted separate electorates to the Muslims. A sizable number of Muslim intellectuals advocated a course of agitation in light of the annulment of the partition of Bengal in 1911. Two years afterward the league demanded self-government in its constitution. There was also change in leadership of the league after the resignation of President Aga Khan in 1913. Mohammad Ali Jinnah (1876–1948), the eminent lawyer from Bombay (now Mumbai), joined the league. JINNAH IN AIML: Hailed as the ambassador of “Hindu-Muslim unity,” Jinnah was an active member of the INC. He still believed in cooperation between the two communities to drive out the British. He became the president of the AIML in 1916 when it met in Lucknow. He was also president between 1920 and 1930 and again from 1937 to 1947. Jinnah was instrumental in the Lucknow Pact of 1916 between the congress and the league, which assigned 30 percent of provincial council seats to Muslims. But there was a gradual parting of the ways between the INC and the AIML. The appearance of Mohandas K. Gandhi (1869–1948) on the Indian scene further increased the distance, as Jinnah did not like Gandhi’s non-cooperation movement. The short-lived hope of rapprochement between the two parties occurred in the wake of the coming of the Simon Commission. The congress accepted the league’s demand for one-third representation in the central legislature. But the Hindu Mahasabha, established in 1915, rejected the demand at the All Parties Conference of 1928. The conference also asked Motilal Nehru (1861–1931) to prepare a constitution for a free India. The Nehru Report spelled out a dominion status for India. The report was opposed by the radical wing of the INC, which was led by Motilal’s son Jawaharlal Nehru (1889–1964). The league also rejected the Nehru Report as it did not concede to all the league’s demands. Jinnah called it a parting of the ways, and the relations between the league and the congress began to sour. The league demanded separate electorates and reservation of 33 per cent seats for the Muslims. From the 1920s on the league itself was not a mass-based party. In 1928 in the presidency of Bombay it had only 71 members. In Bengal and the Punjab, the two Muslim majority provinces, the Unionist Party and the Praja Krushsk Party, respectively, were powerful. League membership also did not increase substantially. In 1922 it had a membership of 1,093, and after five years it increased only to 1,330. Even in the historic 1930 session at Allahabad, when the demand for a separate Muslim state was first voiced by President Muhammad Iqbal (1877–1938), it lacked a quorum, with only 75 members present. After coming back from London, Jinnah again took the mantle of leadership of the league. The British had agreed to give major power to elected provincial legislatures per the 1935 Government of India Act. The INC was victorious in general constituencies but did not perform well in Muslim constituencies. Many Muslims had subscribed to the INC’s ideal of secularism. It seemed that the two-nation theory, exhorting that the Hindus and Muslims form two different nations, did not appeal to all the Muslims. The Muslims were considered a nation with a common language, history, and religion according to the two-nation theory. In 1933 a group of Cambridge students led by Choudhary Rahmat Ali (1897–1951) had coined the term Pakistan (land of the pure), taking letters from Muslim majority areas: Punjab P, Afghania (North-West Frontier Province) A, Kashmir K, Indus-Sind IS, and Baluchistan TAN. The league did not achieve its dream of a separate homeland for the Muslims until 1947. It had been an elite organization without a mass base, and Jinnah took measures to popularize it. The membership fees were reduced, committees were formed at district and provincial levels, socioe-conomic content was put in the party manifesto, and a vigorous anti-congress campaign was launched. The scenario changed completely for the league when in the famous Lahore session the Pakistan Resolution was adopted on March 23, 1940. Jinnah reiterated the two-nation theory highlighting the social, political, economic, and cultural differences of the two communities. The resolution envisaged an independent Muslim state consisting of Sindh, the Punjab, the North-West Frontier Province, and Bengal. The efforts of Jinnah after the debacle in the 1937 election paid dividends as 100,000 joined the league in the same year. There was no turning back for the league after the Pakistan Resolution. The league followed a policy of cooperation with the British government and did not support the Quit India movement of August 1942. The league was determined to have a separate Muslim state, whereas the congress was opposed to the idea of partition. Reconciliation was not possible, and talks between Gandhi and Jinnah for a united India in September 1944 failed. After the end of World War II, Great Britain did not have the economic or political resources to hold the British Empire in India. It decided to leave India finally and ordered elections to central and provincial legislatures. The league won all 30 seats reserved for Muslims with 86 percent of the votes in the elections of December 1945 for the center. The Congress captured all the general seats with 91 percent of the votes. In the provincial elections of February 1946, the league won 440 seats reserved for Muslims out of a total of 495 with 75 percent of the votes. Flush with success, the Muslim members gathered in April for the Delhi convention and demanded a sovereign state and two constitution-making bodies. Jinnah addressed the gathering, saying that Pakistan should be established without delay. It would consist of the Muslim majority areas of Bengal and Assam in the east and the Punjab, the North-West Frontier Province, Sind, and Baluchistan in the west. The British government had dispatched a cabinet mission in March to transfer power. The league accepted the plan of the cabinet mission, but the league working committee in July withdrew its earlier acceptance and called for a Direct Action Day on August 16. The league joined the interim government in October but decided not to attend the Constituent Assembly. In January 1947 the Muslim League launched a “direct action” against the non–Muslim League government of Khizr Hayat Tiwana (1900–75) of the Punjab. Partition was inevitable, and the new viceroy, Lord Louis Mountbatten (1900–79), began to talk with leaders from the league as well as the congress to work out a compromise formula. On June 3, 1947, it was announced that India and Pakistan would be granted independence. The Indian Independence Act was passed by the British parliament in July, and the deadline was set for midnight on August 14–15. The demand of the league for a separate state was realized when the Islamic Republic of Pakistan was born on August 14. On August 15 Jinnah was sworn in as the first governor-general of Pakistan, and Liaqat Ali Khan (1895–1951) became the prime minister. The new nation had 60 million Muslims in East Bengal, West Punjab, Sind, the North-West Frontier Province, and Baluchistan. After independence the league did not remain a major political force for long, and dissent resulted in many splinter groups. The Pakistan Muslim League had no connection with the original league. In India the Indian Union Muslim League was set up in March 1948 with a stronghold in the southern province of Kerala. The two-nation theory received a severe jolt when East Pakistan seceded after a liberation struggle against the oppressive regime of the west. A new state, Bangladesh, emerged in December 1971. In the early 21st century more Muslims resided in India (175 million) than in Pakistan (159 million). Sir Aga Khan was appointed the first Honorary President of the Muslim League and Lord Hume was selected its first secretary. The headquarters were established at Lucknow. There were also six vice-presidents, a secretary and two joint secretaries initially appointed for a three-year term, proportionately from different provinces. The principles of the League were espoused in the “Green Book,” which included the organisation’s constitution, written by Maulana Mohamad Ali. Its goals at this stage did not include establishing an independent Muslim state, but rather concentrated on protecting Muslim liberties and rights, promoting understanding between the Muslim community and other Indians, educating the Muslim and Indian community at large on the actions of the government, but with allegiance to the British Raj, Mohammad Ali Jinnah became disillusioned with politics after the failure of his attempt to form a Hindu-Muslim alliance, and he spent most of the 1920s in Britain. The leadership of the League was taken over by Sir Muhammad Iqbal, who in 1930 first put forward the demand for a separate Muslim state in India. The two-state solution was rejected by the Congress leaders, who favoured a united India based on composite national identity. . The League, however, rejected the proposal that the committee returned (called the Nehru Report), arguing that it gave too little representation (one quarter) to Muslims, established Devanagari as the official language of the colony, and demanded that India turn into a de facto unitary state, with residuary powers resting at the center – the League had demanded at least one-third representation in the legislature and sizeable autonomy for the Muslim provinces. Jinnah reported a “parting of the ways” after his requests for minor amendments to the proposal were denied outright, and relations between the Congress and the League. At Lahore the League formally recommitted itself to creating an independent Muslim state called Pakistan, including Sindh, Punjab,Baluchistan, the North West Frontier Province and Bengal, that would be “wholly autonomous and sovereign.” The resolution guaranteed protection for non-Muslim religions. The Lahore Resolution was adopted on March 23, 1940, and its principles formed the foundation for Pakistan’s first constitution. Talks between Jinnah and Gandhi in 1944 in Bombay failed to achieve agreement. This was the last attempt to reach a single-state solution. Sher-i-Bengal Maulvi A K Fazlul Haq moved the Lahore Resolution and Chaudhry Khaliquzzaman seconded it with Jinnah presiding over the session. In the 1940s, Jinnah emerged as a leader of the Indian Muslims and was popularly known as Quaid-e-Azam (Great Leader). In the Constituent Assembly elections of 1946, the League won 425 out of 496 seats reserved for Muslims (and about 89.2% of Muslim votes) on a policy of creating an independent state of Pakistan, and with an implied threat of secession if this was not granted. M K Gandhi, Maulana Abul Kalam Azad and Jawaharlal Nehru, who with the election of another Labour government in Britain in 1945 saw independence within reach, were adamantly opposed to dividing India. Abu’l Fath Jalaluddin Muhammad Akbar (Hindi: जलालुद्दीन मुहम्मद अकबरجلال الدین محمد اکبر Jalāl ud-Dīn Muhammad Akbar), also known as Shahanshah Akbar-e-Azam or Akbar the Great (15 October 1542 – 27 October 1605), was the third Mughal Emperor. He was of Timurid descent; the son of Emperor Humayun, and the grandson of the memorable Mughal Emperor Zaheeruddin Muhammad Babur, the ruler who founded the Mughal dynasty in India. At the end of his magnificent reign in 1605 the Mughal empire covered most of the northern and central India. Shahanshah Akbar-e-Azam was only thirteen years old when he ascended the Mughal throne in Delhi (February 1556), following the death of his father Shahanshah Humayun. During his reign, he eliminated military threats from the powerful Pashtun descendants of Sher Shah Suri, and at the Second Battle of Panipat he decisively defeated the newly self-declared Hindu king Hemu. It took him nearly two more decades to consolidate his power and bring all the parts of northern and central India into his direct realm. He influenced the whole of the Indian Subcontinent as he ruled a greater part of it as an emperor. As an emperor, Akbar solidified his rule by pursuing diplomacy with the powerful Hindu Rajput caste, and by marrying Rajput princesses. Akbar’s reign significantly influenced art and culture in the country. He was a great patron of art and architecture  He took a great interest in painting, and had the walls of his palaces adorned with murals. Besides encouraging the development of the Mughal school, he also patronised the European style of painting. He was fond of literature, and had several Sanskrit works translated into Persian and Persian scriptures translated in Sanskrit apart from getting many Persian works illustrated by painters from his court. During the early years of his reign, he showed intolerant attitude towards Hindus and other religions, but later exercised tolerance towards non-islamic faiths by rolling back some of the strict sharia laws. His administration included numerous Hindu landlords, courtiers and military generals. He began a series of religious debates where Muslim scholars would debate religious matters with Hindus, Sikhs, Jains, Cārvāka atheists, Jews, and Portuguese Roman Catholic Jesuits. He treated these religious leaders with great consideration, irrespective of their faith, and revered them. He not only granted lands and money for the mosques but the list of the recipients included a huge number Hindu temples in north and central India, Christian churches in Goa and a land grant to the newly born Sikh faith for the construction of a place of worship. The famous Golden Temple in Amritsar, Punjab is constructed on the same site. He even founded a religion, the Din-i-Ilahi (Divine Faith), which included the teachings of major religions of the world, but it amounted only to a form of personality cult for Akbar and started dissolving after his death.